Priority handles the entire marketing and sales process — from the initial receipt of information regarding a lead, to management of telemarketing activities and the recording of price quotes for a potential customer, to the conversion of a potential customer into an actual customer with an A/R account (opened automatically in the Financials module). Once a potential customer becomes a regular customer, orders can be placed and goods can be shipped. There is a strong connection between the Marketing and Sales module and its neighboring modules. For instance, the marketing staff can check for part availability and pricing in order to develop marketing materials and offer price quotations to a prospective customer. In fact, all of this information can be accessed directly from within the marketing-related form the user is currently working with. Similarly, a sales representative can check for part availability or check on the progress of a work order intended for a specific sales order. In addition, production planning and purchase planning are executed on the basis of sales orders. Goods are prepared for shipment and shipped, which, in turn, automatically updates order balances. Invoices are produced and sent to the customer on the basis of the pricing terms designated in the order or the shipping document. Priority supports the definition and management of company branches, which you can then assign to use-defined regions, allowing you to analyze sales data according to both branch and region. You can link each branch with a branch warehouse, thus managing the inventory it contains according to the desired inventory levels defined for the branch. Each worker is assigned to the branch in which he or she works. Furthermore, different types of journal entries can be defined for each branch (for example, you can define a journal entry type for the northern branch called “NBI,” to be used as the default type for sales invoices issued by that branch). Whenever an employee opens a financial document, it automatically receives the transaction type defined for that employee’s branch. You can also define separate document numeration templates for each branch. You can run reports that display sales data by branches (e.g., orders, shipping documents and invoices), and define separate document numeration templates, letterheads and logos for the documents printed at each branch. Data access can be restricted per branch, allowing users to view only those data pertaining to the branches for which they have authorization. Priority manages potential customers during the marketing or pre-sales stage. This precludes the need to open A/R accounts in the Financials module and maintain extraneous customer information until the relationship proceeds to the sales stage (i.e., an order is placed). Although potential and actual customers are considered separate entities, they are still maintained within the same client base. This allows for easier maintenance and the ability to obtain information for the entire customer pool. A potential customer is converted to a regular customer by activating a program. Consequently, an account is automatically opened for the customer in the accounts receivable ledger. Alternatively, a billing customer can be assigned to the new regular customer. Of course, any information recorded for a potential customer preceding the conversion to a regular customer remains in the database. The data maintained for each customer includes: addresses and telephone numbers; business classification; a description of the nature and scope of the business; marketing activities in which they participated; customer group assignment; sales representative; shipping destinations; key personnel, their positions and telephone numbers; price quotations; and the like. Ten customer category fields in the Customers form and report generators enable you to classify customers into various cross-sections, for purposes of analysis and retrieval. Customer related activities, from marketing on through sales and the recording of receipts, are all simplified by the ability to designate key personnel as contacts for distinct functions (price quotes, invoices, sales orders, blanket orders, shipments, customer statements, and/or receipts). This automatically directs all relevant documents to the proper individual. For example, once you have designated a price quote contact for a customer, this individual’s name will automatically appear on the printout of any quoteprepared for that customer. • Representative customers – real or virtual customer records for which you can define price lists, part lists, special prices and discounts. Individual customers that are linked to the representative inherit these settings; however, they are overridden by values defined manually for the customer. • The general representative customer – the settings defined for this customer apply by default to all customers; however, any values defined for a specific customer, or for a linked representative customer, override those defined for the general representative. Maintenance of customer data is managed via statuses using the graphic BPM Flow Chart Customers. After defining the necessary statuses (and the paths that connect them), you can view their attributes in the Statuses for Customers form. Priority allows you to designate prices and discounts for each ordered item. These values become the defaults that appear automatically (with a display of the price source) in various sales documents (e.g., orders, shipments) and may be revised as needed. Pricing terms can be specified separately for individual customers or for groups of customers (by means of the general representative customer, which affects all customers by default, or a user-defined representative customer). • Restrictions on activity (when a customer’s credit limit is exceeded). These values serve as defaults that appear automatically when sales documents are recorded. Most of them can be updated in the individual document, with the exception of those involving customer credit. • Pricing per order – by linking an individual order to prices in a given blanket order, price quotation or customer price list. Each customer can be assigned several different price lists – such as one for each product line — and the same price list can be assigned to several customers (even if they have different billing currencies). Price lists can be maintained in different units of measure (for the same part) and in different currencies – e.g., in ounces and dollars for American customers and in grams and Euros for European customers. Any price list in a foreign currency is converted automatically into the currency of the sales document. A single price list can contain different prices for varying minimum quantities. Price lists are easily maintained with tools for copying, updating by a percentage or set value, automatic addition of items to price lists, and batch assignment of discounts to a group of customers or parts. You can also create a customer price list on the basis of a vendor price list (useful in buy-resell settings). Moreover, you have the option of adding the average shipping expense for the part to the vendor price. Each price list is assigned its own list date. This allows for the maintenance of different versions of the same price list, only one of which can be in effect at a time. By copying and then updating the same price list over time, a pricing history is maintained. Parallel to the price list mechanism, you can designate special part prices that are in effect for a limited time (e.g., during a sale period). During this period, prices in customer price lists and item discounts (but not overall discounts) are disregarded. You can even create a price list of special part prices, which allows you to offer the same special prices to a group of customers. In this manner, for instance, you can offer particularly low prices to high-priority or high-volume customers for a limited period of time; during this period, the customer’s regular price list and any item discounts will be ignored. • Overall discount – applied to the document total. Priority provides a sub-level of the Customers form, in which you can define discounts freely without the need for predefined discount codes. • The price of the part in the base price list. Priority allows you to maintain customer part lists, including the customer’s own catalogue number and name for the part. This information will then appear (alongside the internal Priority number) on any printed price quotation, order confirmation, shipping document and invoice to the customer. You can also restrict items recorded in sales orders and shipments to those parts appearing in the customer’s list, thereby preventing incorrect shipments. A product assembly is a part that is sold as a single unit but actually comprises a variety of items. This can range from an actual assortment of products (such as a gift basket) to a part that is sold in various configurations (such as a computer system). When you record a product assembly in a price quotation or sales order, the form is automatically itemized with the assembly’s default component parts. You can define substitutes for each component part in a given assembly; for instance, if a gift basket includes a bottle of wine, you can create a list of wines from which to choose. You can then enter the list of quote or order items and replace the default wine bottle with another from the item’s Choose list. Each substitute component can have its own price; consequently, you can record several variations of the same product assembly in a single price quote. You can also omit prices for the component parts, and quote a single price for all variations of the product assembly. Product assemblies can be defined as out of use, and reactivated when needed (e.g., during the holiday season). Price quotations are offered to customers in order to document special pricing terms, which will be in effect for a fixed period of time. These terms are offered in return for orders that fulfill a designated minimum quantity. The prices and discounts in a quote are filled in automatically on the basis of the price list and discounts that are currently in effect for the customer, with automatic currency conversions wherever necessary. These values can be revised manually. You can even quote prices in different currencies for specific line items (particularly useful in the dual-currency package), which are then copied as is into the order. Profitability is a key consideration in determining prices quoted to customers, particularly in a buy-resell environment. Priority enables you to calculate profitability directly within the Price Quotations form, comparing the purchase price to the quoted unit price. The purchase price can come from its last price (i.e., the most recent purchase), the vendor price list or the part’s cost (as calculated by cost analysis). You can also make use of a mechanism to arrive at a recommended unit price, based on a designated markup percentage and taking into consideration the sales representative’s commission and discounts. By approving this recommended price, the unit price is updated automatically – providing you with the markup that you have requested. You can then view the amount of profit you will be making. If you are using Cost Analysis for Manufacturers, Priority offers a mechanism for estimating prices when creating price quotations. This is particularly useful in the quoting of prices for parts that have never been manufactured before. The estimate takes into account the part’s current standard cost, any additional costs assigned to the quoted jobs, the desired markup and any sales rep commission. An order can be based on a given price quotation, so that quoted prices and discounts are automatically assigned to items in that order. If the order is in a different currency, prices are converted on the basis of exchange rates effective on the order date. If different prices are offered for varying minimum quantities in this quote, this is taken into consideration: the appropriate price appears in the order according to the quantity ordered. Price quotations can also be used to itemize an entire order; in this case, all parts, quantities and due dates appearing in the quote are copied into the order. 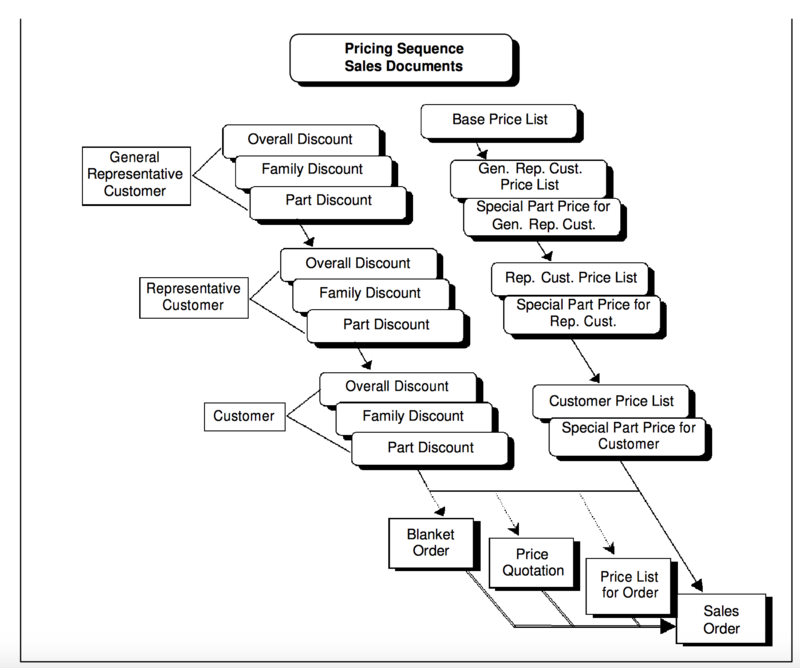 Maintenance of price quotations is managed via statuses using the graphic BPM Flow Chart Customer Quotes. After defining the necessary statuses (and the paths that connect them), you can view their attributes in the Statuses for Price Quotations form. Price quotes can be categorized by type (e.g., a quote for a sold product, a quote for a provided service). For each type you can record a separate set text; this will automatically appear on the printout of the quote. You can even assign a default quote type to an individual user (the person responsible for following it through); whenever a quote of this type is opened, that user will receive a mail message informing him/her of such and requesting that s/he follow through with the pursuit of this sale. A variety of predefined print formats allow you to choose the data you wish to include in the printed quotes you send to your customers. For example, when you are quoting different prices for different minimum quantities of the same item, you can use the No Total format to hide the Final Price column, which is not relevant. You can also use the Report Design Tool to customize your price quotation printouts by hiding or rearranging selected columns, according to the specific needs of each customer. If you are working in a foreign language, a separate report allows you to print price quotations in English, on the basis of English-language values recorded in the system for that purpose. Priority allows you to maintain records for sales representatives and calculate commissions on the basis of prices in sales orders (regular and commission sales), invoices and receipts. You can designate the percentage of commission each rep is to receive for all orders or for specific part families, as well as the maximum discount the rep is allowed to offer customers. If one of your customers begins selling your product, you can define the customer as an external sales rep from within the Customers form. You can link sales reps to their respective customers; consequently, the rep’s name will appear on any orders, invoices or receipts recorded for that customer. A sales rep can also be added manually to any sales document (e.g., price quote, order). The name will then automatically appear on any invoice or receipt based on the order. Invoices or receipts recorded independently by sales reps can be copied and incorporated into the system. Commission due to sales reps is calculated in commission documents, which can be prepared automatically on the basis of customer invoices or receipts. Once the sales rep’s invoice for the commission is recorded in the system, you can link the commission documents to the invoice. The Sales Representatives module features a full complement of reports covering all important data regarding sales reps, including orders, invoices and receipts per sales rep; the account balances of each rep’s customers; commission due to each rep; outstanding customer debts per rep; and any instances in which sales reps exceeded the maximum discount they are allowed to award customers. Reports with asterisks are only available in the dual-currency package. Data access can be restricted per sales rep, allowing users to view only those data pertaining to the sales reps for which they are authorized. Price List-Sorted by Part Desc. • An order can be based on a given price quotation,provided that the quote has the proper status , the order date precedes the quote’s expiration date and the minimum quantity (stipulated in the quote) is ordered. If the quote has been flagged to the Copy All column, all of the quote details are copied into the order (parts, quantities, due dates, prices, discounts). If the quote includes several prices for the same part, depending on the quantity ordered, this is taken into account in determining the part price in the order. • An order can also be opened on the basis of a blanket order, thereby inheriting the prices and discounts recorded in that blanket order. The ordered quantity will be reduced from the balance in the blanket order until it reaches zero. In both cases, additional details are also copied into the order (e.g., document currency, payment terms). In the absence of an existing document, these details are taken from the default billing data assigned per customer. You can also open sales orders for one or more product assemblies, as defined in the Product Assemblies (Sales) form. When the order is not linked to an earlier document, prices and discounts are determined by price lists, special prices and discounts assigned to the customer. You can also designate a specific price list to be used for an individual order; consequently, all prices will be taken from there. In addition, sales order data can be loaded from an external source (EDI). Sales orders can be classified by type. Remarks can be included per line item, which can then be printed out in the order confirmation. Priority calculates profitability for any resold item, comparing purchase price to sale price and taking into account discounts and sales rep commission. Additional details recorded in the sales order include: means of shipment, shipping destination (which can be different for each ordered item), due dates for each item, and budget item or profit/cost center per line item. When a customer shipment is recorded for a given sales order, order balances are updated automatically. The item is closed automatically whenever its balance reaches zero or falls within the part’s defined tolerance range. Orders and order items can also be closed manually. The user can determine whether to have customer credit calculated anew each time a sales order is recorded or calculated by a program activated at the user’s discretion. Based on either of the above calculations, the system will provide a warning whenever an order is recorded for a customer that has surpassed the defined credit limit. You can restrict the parts that can be sold to a customer (i.e., can be recorded in a sales order or shipping document) to only those items that appear in the customer’s list of parts. An error message will be received any time an attempt is made to record an order for such a part. One or more purchase orders can be opened automatically on the basis of a sales order, by defining a vendor for each line item in the Order Items sub-level of the Sales Orders form. You can also open a single purchase order on the basis of multiple sales orders, when the ordered parts are supplied by the same vendor. Blanket sales orders offer special pricing terms to customers in return for a commitment to order a specified quantity over a designated period of time. By definition, a blanket order generates several different sales orders. Priority provides the means of tracking how much of the blanket order remains to be ordered, as well as the financial value of this balance. The order balance, which is originally identical to the quantity of the order, decreases as orders linked to the blanket order are placed for this part. Once the balance reaches zero, the blanket order item is closed automatically. You can also close the item manually, as well as close an entire blanket order. When you base a sales order on a blanket order, prices and discounts are automatically taken from the latter, provided that it is still in effect when the sales order is opened. In other words, only orders placed prior to the blanket order’s expiration date will obtain its special conditions. The Sales Forecasts module can be used to create forecast orders for a specific customer, for a group of customers or for general stock. Priority provides a unique mechanism for using forecast orders to fill actual sales orders: both material requirements planning (MRP) and production planning (finite capacity planning) use the stock planned for forecast orders and orders to stock to meet quantities actually ordered by customers, thereby preventing over-production and reducing inventory carrying costs. A table of monthly or annual forecasts can be prepared manually or automatically. This table, which delineates those parts expected to be ordered and in what quantities in each month, can be used as the basis for opening forecast orders. This is similar to opening a regular sales order, except that the parts, quantities and due dates are taken from the forecast table. The default day in the month that serves as the due date for any forecast order item is determined by a constant value. This may be manually revised for specific forecasts. In Priority, you can view a cross-section of data on any open sales order (per line item), which enables you to detect irregularities and supply delays, as well as to scan due dates, shipment dates and expected payment dates (according to the payment terms designated for the customer). In the dual-currency package, projected payments are converted into the local currency in order to provide a base of comparison and project cash flow. A variety of reports provide both summarized and detailed information regarding orders per customer, part and/or family; demands versus available inventory; planned supply dates; and supply delays. When the Sales module is used in conjunction with the Production module (including production planning), you can view the progress of work orders intended for specific orders — namely, the scheduled date of a given order item’s completion by production lot. You can also see current inventory balances and other existing orders for each item in an order. Priority allows you to track the financial status of each sales order. For example, you can view a customer’s current advance payment balance (how much the customer has already paid, less the amount of advance payment that has already been deducted from invoices). Any order that was linked to either a price index or foreign currency can be displayed in reports for which price adjustments have been made. You can also make use of summary reports to arrive at a forecasted cash flow, as well as the value of all balances to ship in open sales orders. A regular bonus is awarded to all customers upon purchasing a given product, or products from a given part family. A special bonus is defined for a specific customer and is only awarded to that customer. Bonuses can be graduated according to quantity, in order to increase customer incentive by providing larger rewards for larger purchases. • Credit notes – recording the receipt of commissions and the bank transfers by which the vendor paid them. The commission sales mechanism is different from the general sales mechanism in that it is not connected to the Financials module and does not affect inventory transactions. Prices in commission sales are managed in one of two ways, according to a system constant: through the part catalogue or through vendor price lists. The designated price of an item in a commission sale (regardless of which method is used) is entered as the default in any price quote and, if there is no quote, in the commission order itself. Commission price lists are handled in exactly the same manner as regular vendor price lists and supported by the same maintenance tools (e.g., update, copy, effect date). • The price quote serves two main purposes: to record the customer’s RFQ and to request a price quote from the vendor. After the vendor returns a price quote, the agent records his or her own price quote according to the vendor’s reply and sends it to the customer. • The prices recorded in the commission sales price quote are taken from the vendor’s commission sales price list or from the commission price designated in the part catalogue. Maintenance of commission sales price quotations is managed via statuses using the graphic BPM Flow Chart Commiss’n Quotes. After defining the necessary statuses (and the paths that connect them), you can view their attributes in the Statuses for Comm. Sale Quotes form. • The order is written not only in the customer’s name, but also in the name of the relevant vendor. • The order can be based on a price quote for commission sales, in which case parts, prices, due dates and the like are taken from the quote. • If there is no quote, prices are taken from either the vendor’s commission price list or the commission price designated in the part catalogue. • The commission fee expected from the vendor for the sale is recorded for each item. A default value (which can be changed) is taken automatically from a user-defined commission percentage. This percentage can be designated per vendor or per part family sold by the vendor. • Calculation of the commission depends upon the value of a system constant. Using the first option, the prices that appear in the vendor price list include the agent’s commission. This commission is calculated according to the formula: (commission percentage × price) / 100. Using the second option, the prices that appear in the vendor price list do not include the agent’s commission. The commission is calculated according to the formula: (commission percentage + 100)/(commission percentage × price). Maintenance of commission sales orders is managed via statuses using the graphic BPM Flow Chart Commiss’n Orders. After defining the necessary statuses (and the paths that connect them), you can view their attributes in the Statuses for Commission Orders form. The Commission Sales Vendor Invoice serves as a shipping report for commission orders. Each line in the invoice reports the shipping of a parallel line item in the order, and updates the order balance. Maintenance of commission sales invoices is managed via statuses using the graphic BPM Flow Chart Commission Invs. After defining the necessary statuses (and the paths that connect them), you can view their attributes in the Statuses for Invs (Comm Sales) form. The system includes credit notes that allow you to track the receipt of commissions from vendors. For each credit note you can record the journal entries opened when debiting the vendor’s account for commissions due, and when receiving payment of the commissions. The Delivery Scheduling module enables you to plan the delivery of goods to customers by assigning distribution routes and delivery dates to sales orders. You can use an automatic scheduling mechanism, or schedule deliveries manually. Sales order statuses contain an automatic scheduling flag, so that only orders that have the right status are scheduled for delivery. You can also produce a Delivery Picklist report, which displays a list of all sales orders scheduled for delivery, sorted by distribution route and date. This report is useful for company drivers as they distribute goods to customers. The Fashion module is designed for manufacturers and distributors in the fashion industry, who supply chains of stores with a variety of styles, each of which is sold in a variety of sizes and colors. Since these transactions involve large numbers of catalogue parts in an almost infinite number of possible combinations, Priority has been equipped with powerful new tools designed to facilitate the massive documentation that is usually required in this field. The central tool in this module is the assortment matrix, a multi-dimensional chart used to itemize inventory transactions. The chart’s X-axis represents the range of sizes in which the style is produced, and its Y-axis includes a list of colors. The cells of the chart are used to specify how many units of a particular color/size combination are required. The Number of Sets column determines the quantity of complete assortments involved in the transaction. By assigning a distribution type to every kind of store you supply and a product type to every fashion style, you can create a number of default assortments that prevent you from having to fill in each matrix manually. Furthermore, distribution types allow you to create an automatic distribution list of your customers, from which you can generate purchase orders and packing slips that are itemized by assortment. In the fashion industry inventory transactions occur between a central warehouse (usually a factory) and specially defined retail warehouses. These latter warehouses may be factory outlets that belong to your company or franchises that belong to your customers. Inventory control is maintained in both cases, in order to ensure that sufficient merchandise is available for sale, even though goods shipped to a franchise are no longer considered company inventory. • The Fashion Wizard, which includes comprehensive explanations, step by step, on how to work with the Fashion module.